Google And GoDaddy Ban White Supremacist Site After Virginia Rally : The Two-Way Both Google and GoDaddy have now banned the Daily Stormer site, after it published a story mocking protester Heather Heyer's death in Charlottesville, Va. The Daily Stormer site had a story that claimed to be written by hackers and gave the site 24 hours before it would be deleted — the same deadline set by GoDaddy. After a purported hack and a 24-hour deadline to relocate its Web domain, the Daily Stormer, a neo-Nazi website that promoted the "Unite the Right" rally in Charlottesville, Va., moved its site to Google before its registration there was also refused. "We are cancelling Daily Stormer's registration with Google Domains for violating our terms of service," a Google spokesperson told NPR on Monday. Shortly after we received that message, the Daily Stormer site began to go offline at least intermittently, displaying the message, "We're having an outage. it'll be a minute." The moves come after GoDaddy cut ties with the Daily Stormer late Sunday. The Web hosting service had received calls to ban the site over its hate-filled stories — particularly an article mocking Heather Heyer, 32, an anti-white nationalist protester who was killed in Charlottesville, Va., this weekend. After posting an article that claimed the site had been hacked — and that it was under threat of being deleted within 24 hours — the Daily Stormer's founder, Andrew Anglin, announced early Monday afternoon, "I've retaken control of the site." A look at Web domain data for DailyStormer.com shows that it was registered through Google, in records that were updated on Monday. GoDaddy had banned the site after receiving complaints from the public led by women's rights advocate Amy Siskind, who‏ wrote via Twitter, "@GoDaddy you host the Daily Stormer — they posted this on their site. Please retweet if you think this hate should be taken down & banned." More than 6,500 people retweeted her message, and the Web service replied late Sunday night: "We informed the Daily Stormer that they have 24 hours to move the domain to another provider, as they have violated our terms of service." 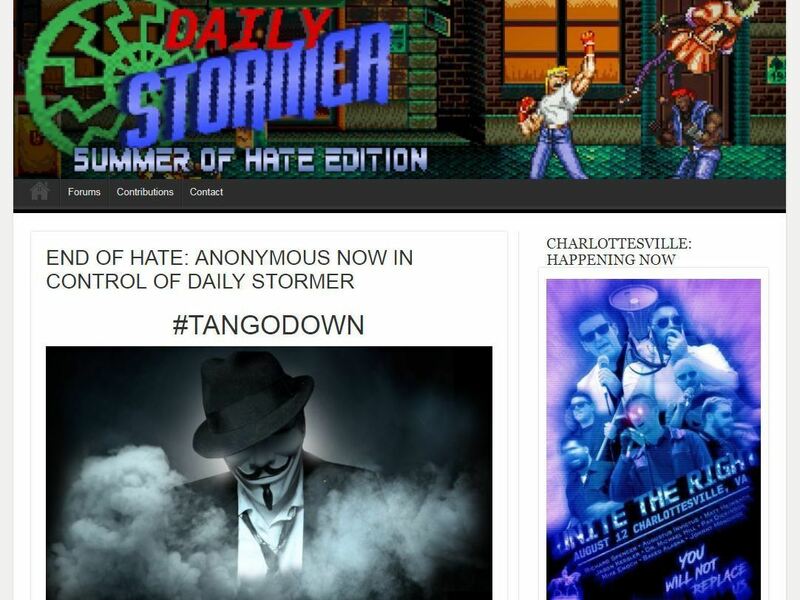 Anglin and the Daily Stormer were seen as trying to spin the threat of being taken down, posting a story that claims to be written by hackers affiliated with the activist group Anonymous. But a main source of news about Anonymous says the group doesn't seem to have been involved. In a page on the Daily Stormer, the purported hackers said the site would be deleted — on the same timeframe set by GoDaddy. In a break with notable hacking takeovers, the story didn't appear as a message plastered on the front of the site; instead, it was published alongside other stories, including the one about Heyer. The Daily Stormer was founded by Anglin, who also writes much of its most high-profile content; the site is supported by reader donations rather than by advertising. The alleged hackers' message included the hashtag #TANGODOWN — a term that was quickly used by opponents of the site's views to celebrate its seeming demise. News organizations around the world ran stories about the apparent takeover, which had included the explanation, "this evil cannot be allowed to stand." But a Twitter account that often relays news about Anonymous states, "We have no confirmation that 'Anonymous' is involved yet. Looks more like a DS stunt. Wonder if they are having issues finding a new host." Referring to the all-caps message posted on the site — about an elite team targeting Anglin and his site — the account states, "We find [the] claim that it took a 'UNITED FORCE OF ELITE HACKERS' to hack a CMS run by amateurs incredibly amusing." People commenting on the Daily Stormer site also found the situation amusing, noting that the supposed hackers had said they had located Anglin and would be "sending our allies in Lagos to pay him a visit in person." "LOL, this meme just won't end," one person wrote about the Lagos reference. Anglin revisited the idea in his update, stating, "I want to thank the Nigerian government for their help." Earlier this year, Anglin's website was linked to an office in Worthington, Ohio, the Columbus suburb where he went to high school. As Columbus Alive reported, "Anglin's current whereabouts remain unknown." The most popular response on the comment board was one that mocked people on Twitter who had announced the Daily Stormer had been taken over. "Anglin you are a legend," one person wrote.